Summer. It’s hot. And humid. And the thought of heating up my oven seems unbearable on those hot summer days. So we opt for the easier meals in summer — salads, smoothies, fresh fruit, and so on. How can we blame ourselves? The farmers’ markets are all open, the sun is shining, and all of our favorite fruits and vegetables are in season. Not to mention all the memories that summer produce ignites in our systems; especially for California girls, like me. 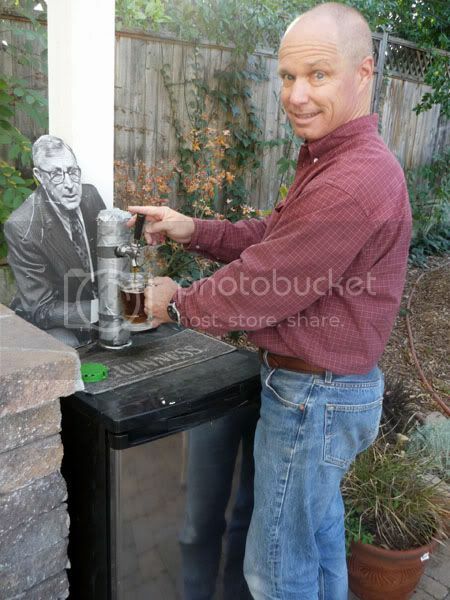 The summer foods make me long for my parents’ backyard pool and patio kitchen: the site of pool parties upon pool parties, starting in high school and lasting until the week before I said good-bye to my beloved patio grill, and John Wooden, featured here, who still bartends my Dad’s precious kegerator. With regards to John Wooden’s recent passing, my dad sent me an email with the subject title “Hey, at least I have a pretty valuable bartender now.” I guess it’s only okay because my dad has dedicated such a large portion of his life saluting JW. I suspect the same print out of JW’s pyramid of success has been hanging in his offices for the past 25 years. A lot of my recipes are derivatives of things my parents whipped up on that beautiful patio — mostly things that I haven’t posted here, usually because I can’t take photos at night without a light box, and the fact that the dinners rarely ever last through the morning for photographs. It might be because I don’t like to eat dinner alone, so I generally have people over all the time. What can I say? I enjoy good company. I do, however, really enjoy the sporadic rain and thunderstorms in Washington. This Sunday, Silje and I made an impromptu trip to Eastern Market, only to rush home within twenty minutes of arriving, because the market had packed up right as an isolated T-storm raged on. Umbrella-less, we decided to hit my kitchen and throw together fresh snacks. Here are a couple of easy balsamic recipes that I promise you will love. It’s pretty self explanatory from the photos. Thinly slice the cucumbers and tomatoes, and then drizzle with balsamic vinegar. Grind salt and fresh black pepper to the seasoning of your preference. First: don’t hesitate. I know you are all thinking: what is this girl talking about? Who mixes vinegar with fruit? Well, get over it, and trust me. Every single person I’ve made this for has given me a look of disgust until I force fed them these strawberries — and then they end up finishing the strawberries before I even get the chance to pair it with anything else. Needless to say, my friends do trust me in the kitchen, so I don’t actually force feed them… but sometimes I like to think that, just to feel like I had the power to change someone’s mind, dramatizing the event in my own head. Balsamic vinegar and strawberries might actually be my favorite unexpected combination in the world. I grew up eating strawberries with whipped cream, or sugar. Until I met balsamic vinegar — which actually makes the strawberries taste unbelievably sweet. If anything in this world could make a bowl of red, ripe strawberries taste even more like strawberries, it’s balsamic vinegar. So, get out your best paring knife. I prefer to slice the strawberries first across the top, to chop off the greens, and then vertically, so they form little triangles. Then, go crazy. But not too crazy. Drizzle your strawberries in balsamic. Toss. Eat. Alone, or with vanilla ice cream.